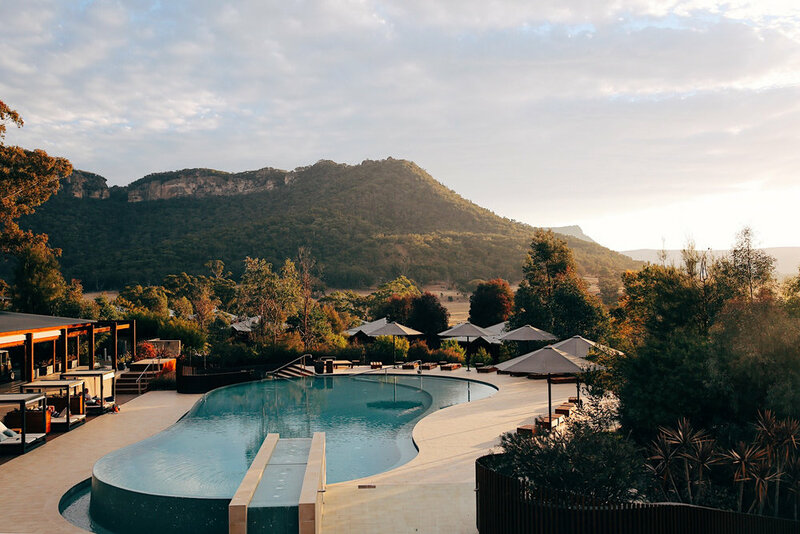 A two hour drive out of Sydney, through the Blue Mountains and deep in to an empty valley, Emirates One&Only Wolgan Valley appears like an oasis in a desert. Greeted at a security entrance, where you leave your car and hop in to a swish Land Rover Discovery, your Australian safari adventure begins. 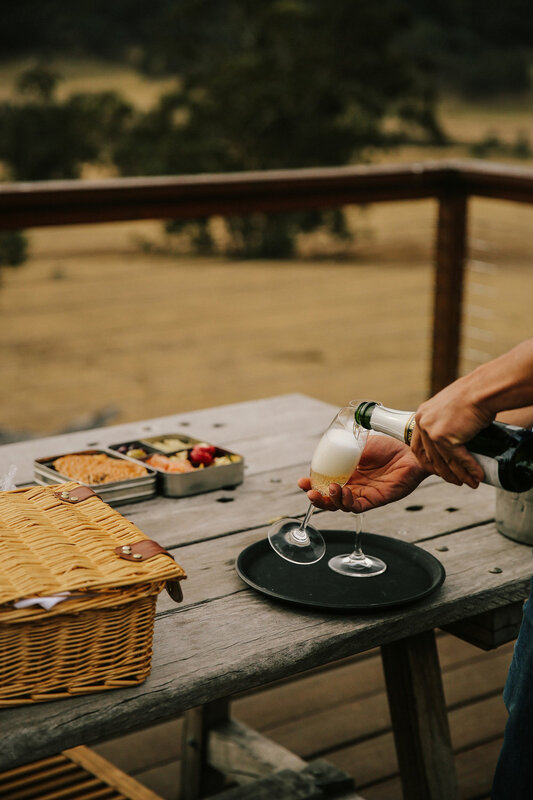 Arriving at a grand lodge, you’re greeted with champagne and views of a sun drenched valley, dotted with kangaroos and surrounded by endless clusters of mountains. 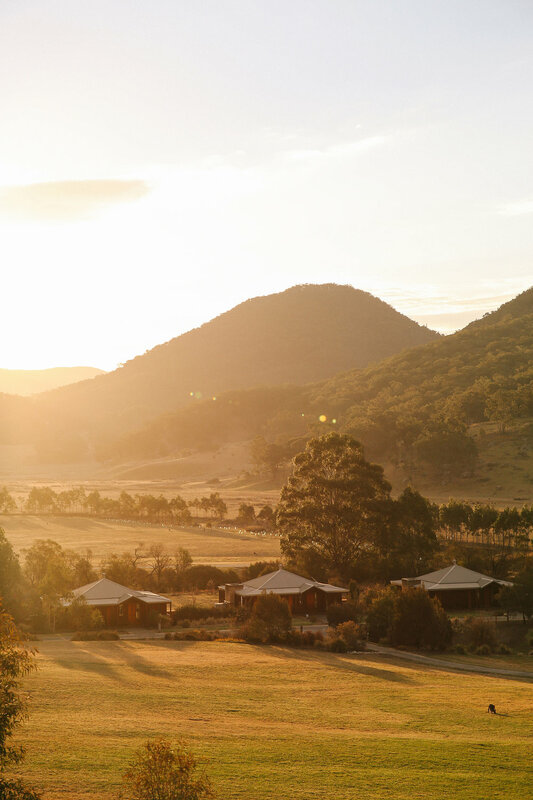 Villas at Wolgan Valley are grand whilst maintaining a sense of place in the landscape. 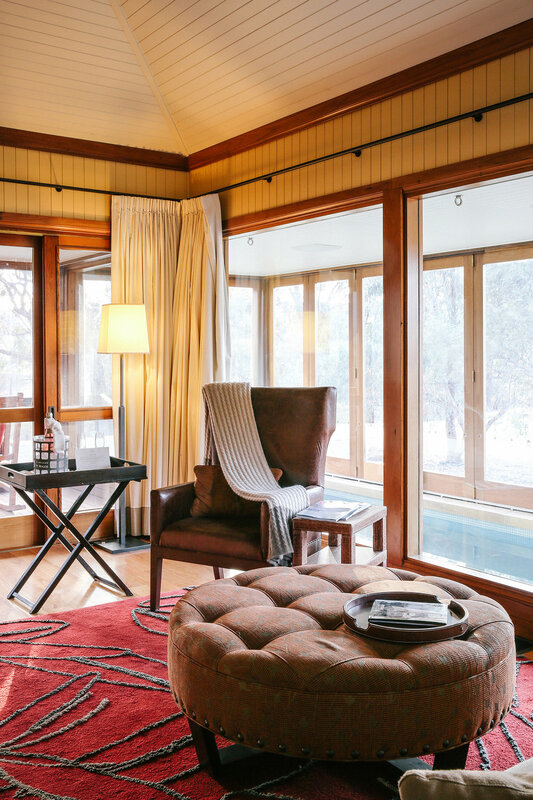 All face the valley and come with rocking chair clad balconies and glimmering heated plunge pools. 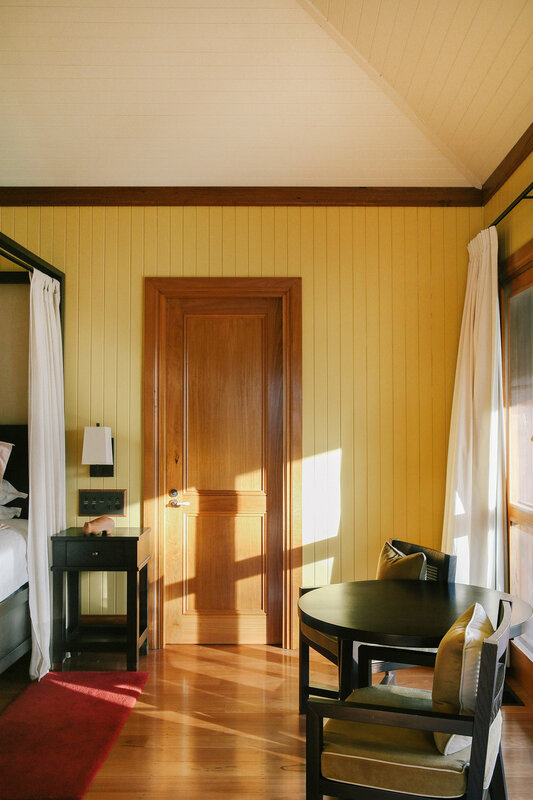 The space is furnished with plush, classic pieces in rust-coloured tones and a draped four-poster bed that beckons after a full day of activities. The bathroom is just as luxe, with a bathtub that has it’s own window looking to the mountains, an oversized rainshower and twin vanity sinks. No detail is overlooked, with books filling the shelves around the televisions (there’s two) and a complimentary mini bar stocked full with artisan chocolate blocks in dark, milk and white, crisps and drinks. 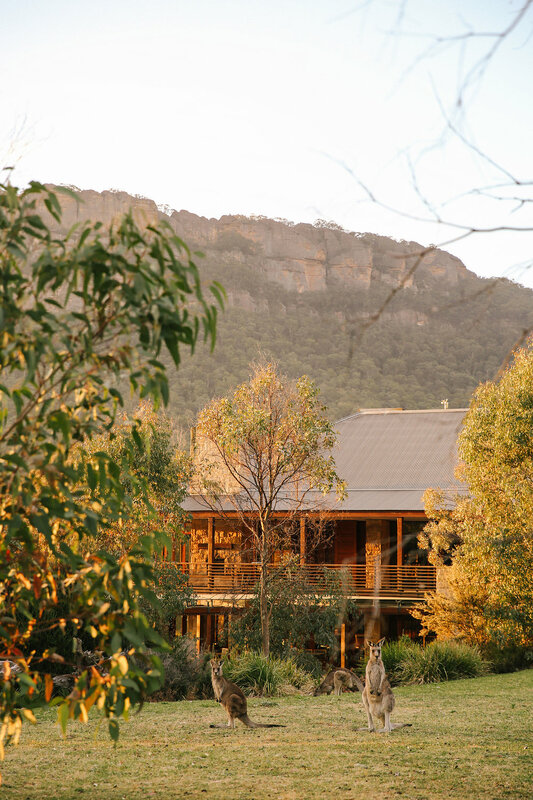 Mornings at Wolgan Valley start with a breakfast that can only be described as sumptuous. A buffet full of changing daily specials such as maple muffins and mixed pastries sit next to an international cheese selection, fruit, house made cereals, breads and ham. There’s a cook-to-order menu available too with hip Aussie favourites such as smashed avocado, quinoa porridge with coconut milk and eggs. Lunch is served on the ground level in a casual restaurant overlooking the property. Alternatively staff can set up a picnic at one of the many viewing points with your choice of wine, sandwiches, fruits, salad and sweet treats. It’s brilliant sitting under gum trees, watching kangaroos hop by whilst grazing on a gourmet wrap, followed by a bushwalk on one of the properties many walking tracks. Dinner is a more formal affair, with a modern Australian three-course and degustation menu on offer. Starters such as a pumpkin tortellini in a butter sauce are mouth wateringly good. A main of eye fillet is cooked perfectly and sides of mixed veg and mashed potato hit the spot. 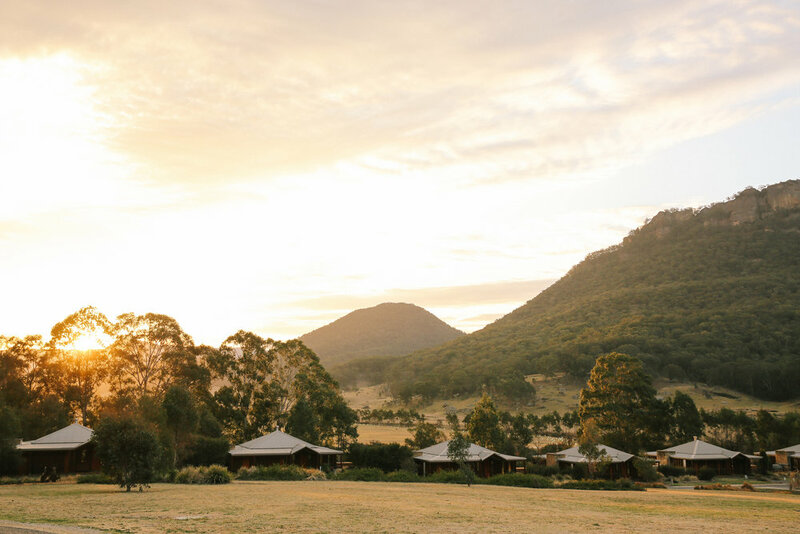 You’re not short on things to do at Wolgan Valley. It’s quite magical to spend time at the stables with the Wolgan Valley horses. Beautifully kept and looked after, you can take a tour of the stables and feed the horses or book in for a ride up the mountains. For those less adventurous, you can indulge in a cheese and wine tasting in the cellar. The lodge sommelier takes you through a selection of both local and international cheeses and pairs them expertly with outstanding wines. Equally good is the resort bar which opens on to a sun drenched deck with spectacular views. It’s the perfect spot for an afternoon tipple and some bar snacks. If you’re in need of some rejuvenation, book in to the world class One&Only spa where treatments are carried out by expert therapists in rooms that are designed with optimum zen in mind. Uniquely, the spa even has it’s own house candle by cult candle and fragrance label Lumira and you can follow up your treatment with a dip in the pear-shaped infinity pool that boats sweeping views of the estate. The property itself spans over an area of over 7000 acres and was purchased by Emirates as a project to conserve and the restore the land, which was once used for farming. 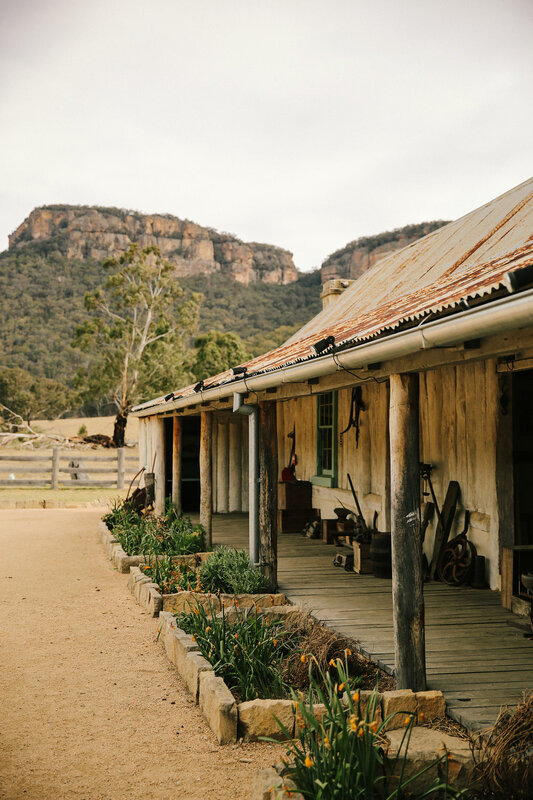 There’s an old homestead which has been mostly restored and can be visited by guests to get an insight in to farming life during those times. In the evenings it’s great to book in for a night safari, where a guide drives you around the property spotting kangaroos, wombats, wallabies and possums. It’s amazing to witness nocturnal animals in their natural habit on an intimate level and finish up with some star-gazing. And in the unlikely event you feel like wrapping yourself up in your villa and switching off, it’s the perfect place to do it. 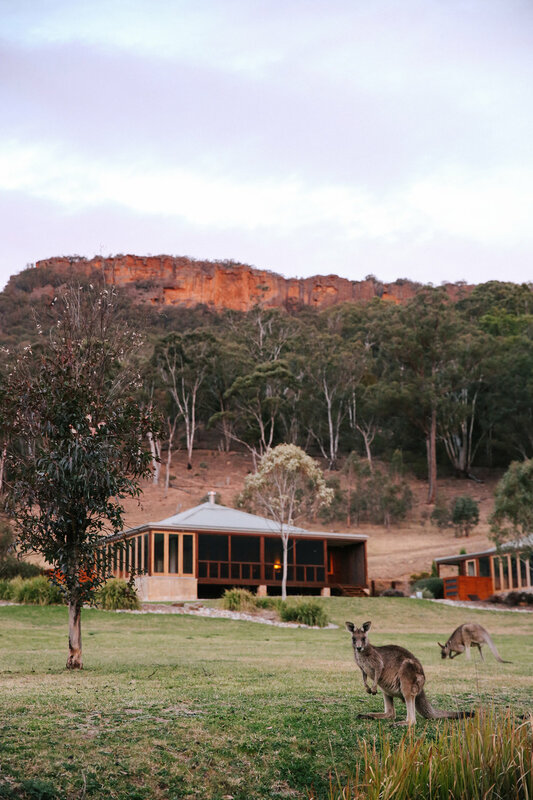 With no phone reception (there’s great WiFi if you absolutely must stay connected to the outside world), you can happily switch off, sit on your balcony and watch the kangaroos graze right before your eyes. MINI BAR: Complimentary chocolates, tea, coffee, snacks. POOL/GYM/SPA: Villas come with an indoor heated plunge pool. There is also a communal infinity pool, fully equipped gym and world class spa. LOCATION: Wolgan Valley, a three hour drive West of Sydney. CHILDREN: Welcome with a great list of activities. Cots for children under three years of age are free. RATES: Two-night escapes commence from $1,890 per evening in ultra-luxury Heritage Villa with private pool, gourmet breakfast, lunch and dinner daily, selected range of local wines and beers with meals and non-alcoholic beverages and two nature-based activities. GOOD TO KNOW: No cell phone reception here. Prepare to switch off. ROOM PICK: Any - all face the valley and come with plunge pools. WIFI: Yes, great connection throughout the resort. I stayed courtesy of Emirates One&Only Wolgan Valley.